As crossovers begin to take over a market once dominated by SUVs, you might think the end is nigh for traditional full-size sport utility vehicles. But there are still those who need a vehicle that can carry both a large family and toys like a boat or ATV. This is where full-size SUVs like the 2017 Chevrolet Suburban continue to reign. The Suburban is one of the oldest nameplates in the automotive world, first appearing back in the 1930s. Chevrolet gave its largest SUV a massive redesign a couple of years ago. 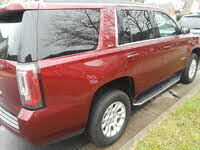 For such a huge vehicle, the Suburban is quite handsome, with a large grille, chrome accents, and crisp lines. Depending on the trim, wheels range in size from 18 to 22 inches. The only real change for 2017 is the addition of 2 new colors, Blue Velvet Metallic and Pepperdust Metallic. Chevrolet earned a lot of praise for the Suburban’s revised interior back in 2015, which included an improved dash layout and the use of higher-quality materials. All Suburbans also feature an 8-inch color touchscreen with Chevrolet’s MyLink infotainment system. MyLink is one of the easiest systems to use thanks to its large touch buttons and sharp graphics, but it should be noted that the system is sometimes slow in responding to inputs. When it comes to seating, the Suburban offers capacity for either 7, 8, or 9 passengers, but the 9-seat option is available only on the base LS trim. Cargo space is impressive for the class, at 38.9 cubic feet behind the third row. Fold those third-row seats down and space increases to 76.7 cubic feet. Fold both rows of rear seats down and you’ll have 121.1 cubic feet of space. The upcoming model year sees Chevrolet dropping the LTZ and making the Premier the Suburban's top-of-the-line trim. The LS and LT trims stick around with no major changes. The LS features rear privacy glass, heated side-view mirrors, remote start, an 8-way power seat for the driver, a 4-way power seat for the front passenger, tri-zone climate control, Bluetooth, 5 USB ports, and OnStar 4G LTE with a Wi-Fi hotspot that can provide high-speed Internet for up to seven devices. Step up to the LT and get a power tailgate, automatic headlights, a tilt-telescoping steering wheel, a memory function for the driver’s seat, leather upholstery, heated front seats, and a 9-speaker Bose audio system. The Premier adds push-button start, xenon headlights, GM’s Magnetic Ride Control system (which uses special shocks filled with magnetic fluid to provide a smooth ride), second-row captain chairs, heated and ventilated front seats, and a 10-speaker Bose audio system. 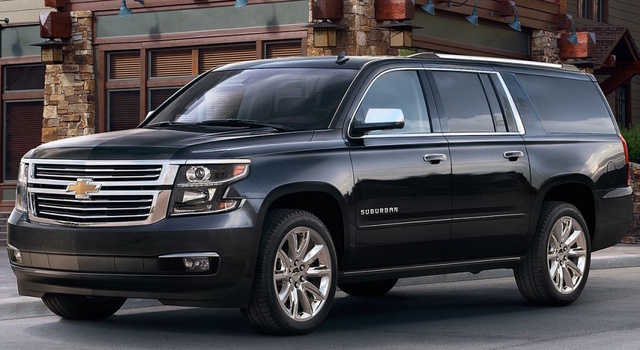 The Suburban only comes with one engine, a 5.3-liter V8 making 355 hp and 383 lb-ft of torque. This engine is paired with a 6-speed automatic transmission and your choice of either front- or 4-wheel drive (FWD or 4WD). If you want a more powerful V8, you’ll need to step up to the GMC Yukon XL Denali. Fuel-economy figures stand at 16 mpg city/23 highway/19 combined for 2WD trims and 15/22/18 with 4WD. All Suburbans come equipped with a trailer-hitch receiving jack and wiring harness. Tow ratings stand at 6,300 pounds for 2WD trims and 6,000 pounds for 4WD trims. An optional max trailering package boosts the tow rating by 2,000 pounds by swapping the rear axle ratio and adding a heavy-duty suspension with air leveling. This package also adds a built-in trailer brake controller on the LS and LT. The Suburban’s safety credentials see an improvement for 2017. First, all Suburbans will feature the Teen Driver system that debuted last year in the Malibu midsize sedan. Teen Driver allows a parent to limit vehicle speed and audio volume and mutes the audio system until everyone in the vehicle buckles up. The system will also provide a report that lists how far the vehicle traveled, the maximum speed achieved, and how many times the antilock brakes and stability control system activated. Low-speed automatic emergency braking comes standard on the LT and Premier and optional on the LS when equipped with the Enhanced Driver Alert Package. Standard safety equipment for the 2017 Suburban includes front-seat side airbags, full-length side curtain airbags, stability control with trailer sway control, rear parking sensors, a backup camera, and GM’s OnStar telematics system, which can automatically call emergency services in the event of a crash. Other OnStar features include remote unlocking, roadside assistance, and the ability to locate your vehicle if it's stolen. LT and Premier trims feature forward-collision warning, the safety alert driver's seat (vibrates the left or right side of the seat to warn the driver of danger), and lane-keeping assist. Blind-spot monitoring with rear cross-traffic alert is standard on the Premier and optional on the LT. The National Highway Traffic Safety Administration awarded the Chevrolet Suburban an overall rating of 4 out of 5 stars. At the time of this writing, pricing for the 2017 Chevrolet Suburban hasn’t been announced. The 2017 model doesn’t bring any significant changes aside from safety, but that isn’t a bad thing. The Suburban is one of those vehicles that follows the mantra of "If it ain’t broke, why fix it?" This mantra has served the Suburban well for the past 80 years and will likely continue to do so. What's your take on the 2017 Chevrolet Suburban? Users ranked 2017 Chevrolet Suburban against other cars which they drove/owned. Each ranking was based on 9 categories. Here is the summary of top rankings. Have you driven a 2017 Chevrolet Suburban?